"A delicious, sweet marinade using real maple syrup. 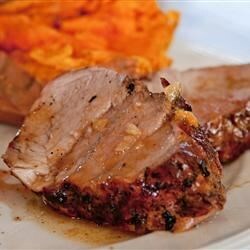 Great on chicken or pork tenderloin." This was really good! Like others, I decided to bake this in the oven. I baked it @ 375 for 45 min. It turned out perfect, and the marinade was delicious. Thanx for sharing! This recipe was great. We decided to cook this in the oven instead of the grill. It took about an hour for it to bake. It was very tender! We will have this again.